We ordered the momos of course since its in their name! We got steamed chicken and fried pork momos. Both were absolutely delicious! The pork was a lot more juicy and had more flavour since pork is saltier. Outrageously delicious foods. The Chili Chicken was cooked to perfection. The chicken was so tender, and the veggies cooked just right. Just a warning, it is really spicy. So spicy that my eyes started tearing, yet it is so delicious that I could not stop eating it. I also tried the regular chicken momo and the chili chicken momo. Both were steamed to perfection, and the filling was so flavorful. I could not wait to eat the momos, and my impatience did lead to me burning my tongue a bit...but it was worth it! The chicken chilli momos were really good. The rest of the food we ordered (the chicken chowmein and chilli chicken) was flavorful too, but momos were the stars. This is really a take-out place and I wouldn't recommend dining in. We decided to dine-in and the service was a little chaotic. But you def get your moneys worth. Totally would order takeout/pick up from here! Order spicy chicken momo. They make everything fresh by hand. After I placed my order it took about 10 minute. They aren't just freezing product and throwing it in the fire! Got to watch the woman hand making the Momo too! BEWARE the spicy version of any of the MOMO is spicy! I love hot but these really had a kick! Great for a casual meal or take-out. If it was more accessible, I would eat here much more often. Hot, fresh momo are hard to beat, though I may be biased as I just love dumplings in general. I also enjoy their simple stir fried noodles. There isn't much seating (a couple of table and a countertop), so plan to get take-out just in case. Service has been friendly. ITS AWESOME!!! You must try it to give your taste bugs something different. The dumplings are stuffed with large portion of nice, high quality juicy meat. Pork, beef, chicken. We ordered them all. All the same large size and freshness. If you like spicy food, the orange sauce stings nicely with flavor. 8 pieces per order. 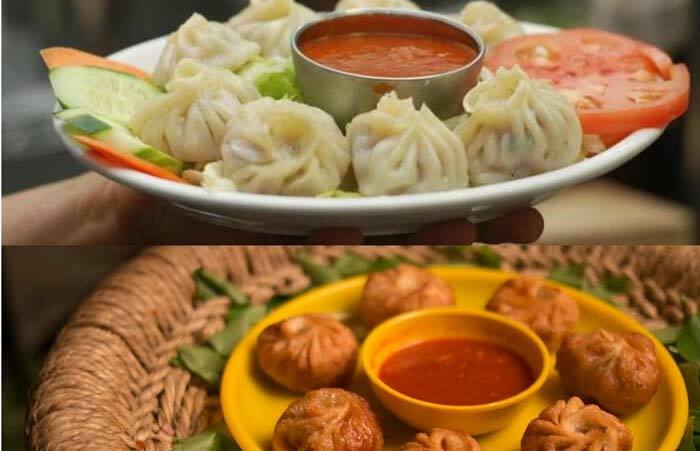 Himalayan style dumplings. With 2 signature momo chutneys.